• The design of the Goelst 2200 track is makes it extremely stable and gives it an elegant look. • The ideal track for sheers and light or medium-weight curtains. • Used in a wide variety of situations, such as private homes, but also in office buildings and in the care sector. 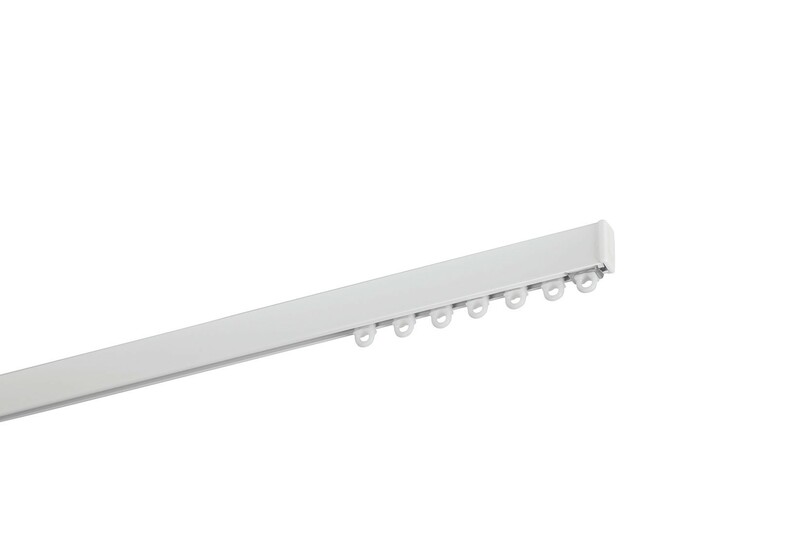 • This curtain track can be easily mounted on either a ceiling or a wall. • Easy to bend forward or reverse, and of exceptional quality. The design of the Goelst 2200 track makes it extremely stable and gives it an elegant look. It can be easily mounted in various ways on a wall or ceiling. A very popular track that can be used in a wide variety of situations, such as private homes, but also in office buildings and in the care sector. Stable and elegant curtain track. Aluminium track; can be forward or reverse bent in different radii. Available as standard in two colours: white and anodised aluminium. Accessories available in matching colours. Lengths: 4m, 5m, 6m, 7m. The design of the Goelst 2200 track is makes it extremely stable and gives it an elegant look. It can be easily mounted in various ways on a wall or ceiling. A very popular track that can be used in a wide variety of situations, such as private homes, but also in office buildings and in the care sector. High quality wear-resistant, extremely colourfast, UV-resistant coating. 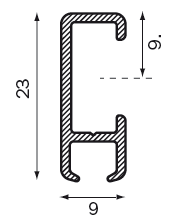 Dimensions (hxw): 23 x 9 mm. Maximum supported weight guideline: see fixing guide. 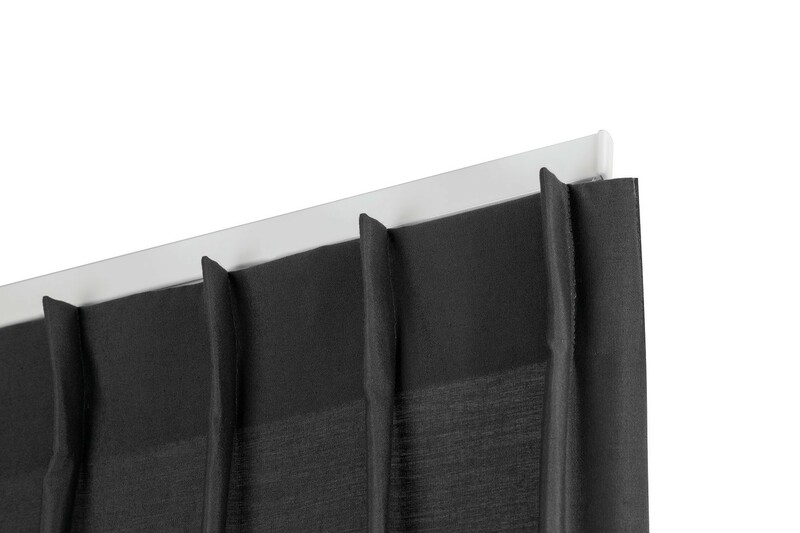 An additional support bracket is recommended at points where pleated curtains gather when open. The 2200 can be forward or reverse bent to create attractive returns. Minimum bending radius: 8cm with bending tool 1013. Standard bending radius: 10cm with bending tool 1012 or 1015. Other bending radii: greater than 80cm with bending tool 1018. Twelve self-lubricating 2010 gliders per metre and two 2001 end stops per track system. Ceiling support brackets 2250 or wall support brackets 2251, or mounted on a window frame with button clips 2254. 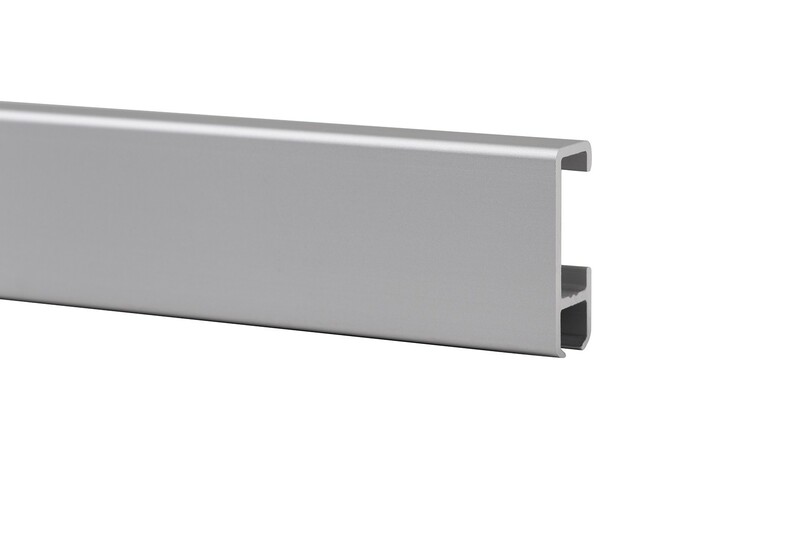 Curtain tracks longer than the standard length can be joined together with connecting bridge 2252-N.
• 2010 gliders are available with various hook types. • For perfectly closing curtains with an overlap of the curtain fabric, use pilot runner 4074-1000 or the smaller pilot runner 4075-1000. 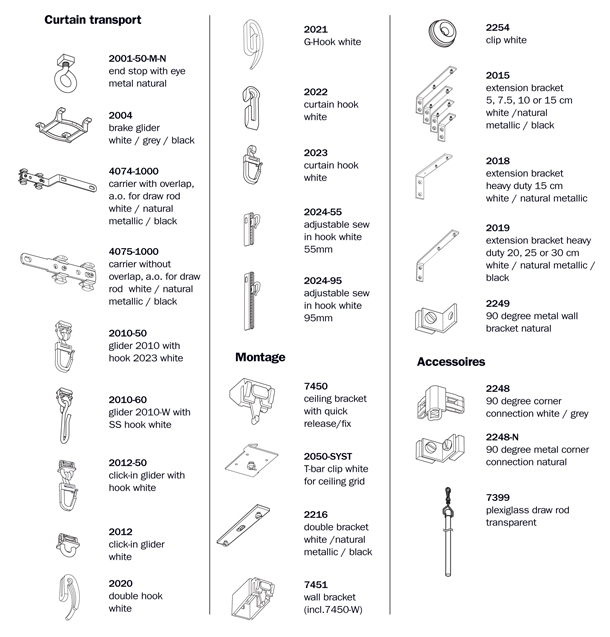 • The 2200 curtain track is compatible with the Goelst Flow System: gliders 2014-060 or 2014-080. • The 2012 click glider can be placed anywhere in the system. It is advisable to place gliders of this type on the stacking side. 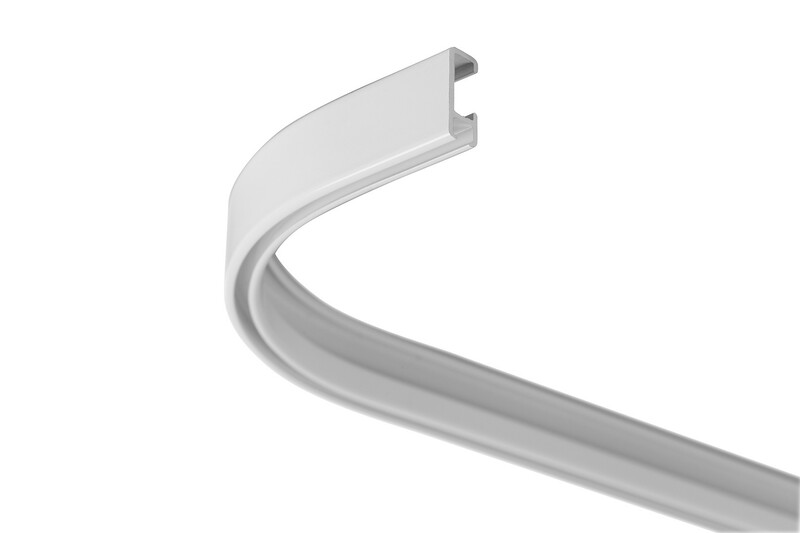 • T-bar clip 2050-SYST should be used in combination with ceiling support bracket 2150 when fixing to ceiling tiles. • For fixing two curtain tracks perfectly to each other and only having to drill one row of holes, mount the ceiling support brackets on double fixing bracket 2216. • Wall mounting with plastic wall support brackets 2251 2.8cm or wall support brackets 7451 6cm. • When mounting at a distance from a wall, use extension brackets 2015 (5, 7.5, 10 or 15cm) in combination with ceiling support brackets 2250 or 7450. 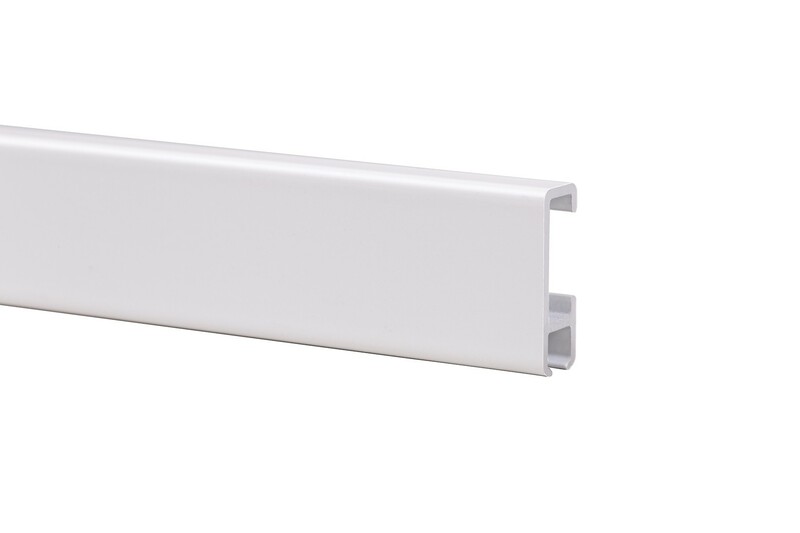 • When mounting at a distance from a wall, use extension brackets 2018 (20cm) and 2019 (20, 25 or 30cm) in combination with ceiling support brackets 2250 or 7450. • Use the special glider stop for ‘spring-back’ curtain sets: fit the glider stop over a 2010 glider after it has been inserted in the channel profile. Several glider stops can be placed if necessary. • Selection of various pull rods for opening and closing curtains by hand: usually used with curtains that are light in colour and show signs of wear more quickly and delicate curtain fabrics, such as sheers (in combination with lead gliders 4074-1000 or 4075-1000). Shape and size tolerances in accordance with EN 12020. Anodisation: in accordance with QUALANOD requirements, coating thickness 10µm. Natural colour anodised. Powder coating: in accordance with QUALICOAT requirements, thick coating (+/- 100 µm), AkzoNobel/Goelst quality for improved gliding properties and excellent ductility. White RAL 9010. 2200 track weight: 164 gr/m. Goelst self-lubricating, UV-resistant gliders made from high-quality plastic. Twelve 2010 gliders per metre and two 2001 end stops plus two 2253 end caps per track length. Ceiling support brackets: 2250 (the amount required depends on the system length). Connecting bridge 2252. 2010 gliders are available with various hook types. Glider stop 2004. Metal end stop with eye 2001-50-M-N. Overlap brackets 4074-1000 and 4075-1000. Ceiling mounting with plastic support brackets and twist nose cap 7450. Parallel ceiling mounting using double fixing bracket 2216 (ceiling support brackets 2250 or 7450 also required). Wall mounting with plastic support brackets 2251 or 7451, or button clips 2254 for mounting directly on or in a window frame. Wall mounting on extension brackets 2015, 2018, 2019: for different distances from the wall (support brackets 2250 or 7450 also required). (Perpendicular) wall mounting with angle bracket 2249. Offset tracks can be joined with corner connector 2248. Suitable for Goelst Flow bespoke curtain systems. Spacing between support points (cm) in accordance with the G-Standard or the table below. General advice: place an additional bracket on the stacking side(s) and, if possible, a support point immediately before and/or after a curve. Track profile with a relatively high bearing strength: if necessary, place additional supports to prevent horizontal movement when opening and closing curtains. General advice: impregnate with Goelst silicon spray (1251-250) at least 1x per year. • Advice: Place an additional support on the stacking side(s). See fixing guide. • The lead gliders are suitable for attaching to a pull rod. Using a pull rod to open and close the curtains keeps the fabric clean and prevents stains and signs of wear.